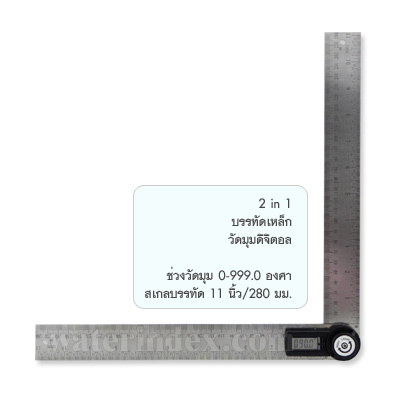 This Stainless Steel 2-in-1 ruler and digital angle finder with moving blade can calculate internal and external angles and measures length quickly and accurately. A convenient stable locking function can lock the measurement at any angle or position to transfer angle measurements. The angle rule can rotate a full 360° without restriction and instantly measure angles accurately to within 0.3°, so even obtuse angles can be calculated if required. , making it useful for layout work, machine set-up (table-saw blades, jointer fence etc) and trim installation. The flat and straight edges of the meter are perfect for marking accurate lines with a marker or pencil. It could be well used into various fields besides of Angle ruler, Straight ruler and Square Ruler and simple to mark points along two edges of a board as well, or material simultaneously - especially useful for marking out mortise and tenon joints, stopped dadoes or any other cuts involving dual measurement on two 90° edges. The ruler's length is up to 600mm(60cm) with scales etched into the faces of the ruler and painted, rather than just surface painted to ensure they don't rub or scratch off easily, ensuring longevity in scale reading. No more guessing the inside or outside corner angles on walls when installing crown, chair rail or base moldings. This gauge will allow you to cut mitered joints correctly the first time. Use to set the miter or bevel angle on virtually any tool. A simple but effective device for measuring, marking and finding angles quickly and easily and more accurate with the 2-in-1 ruler and digital angle finder today! With CE, RoHS and PAHs standard.